GROAN. That’s my response to the cheesy humor on equally cheesy Valentine’s Day e-cards the Republican Party’s putting out for the big “romantic” holiday. The RNC circulated an email this morning featuring six different e-cards featuring the Democratic presidential hopefuls that you can send to the special Republican in your life this Thursday. 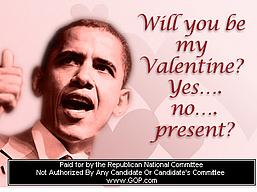 The RNC folks aren’t alone in using politicians on their Valentine’s cards. Hallmark released a first-ever four-card series earlier this year featuring President Bush, Secretary of State Condoleezza Rice, Al Gore, and Clinton as cupids. “Is it global warming in here, or is it just you?” says the Gore card. Obama didn’t make the cut for the Hallmark series. Don’t Dare Mention That, You! The Nation of Islam will, too. Then, Beware if you’re a Jew. Obama’s NOI staffers are, too. Okay, so mine aren’t too good, either. But I’m not trying to compete in the humor–or Valentine–biz. Hey, GOP, get some real comedy writers. STAT. Can you dream up some new Valentine’s Day comedy for the humor-starved GOP fuddy-duddies? Post in the comments section. And attacking McCain like a shrew. A dead party writes dead jokes. Nothing shows how far out of it the GOP is like those awful cards.